Life is full of mysteries. One example of this is “What do you buy the beer geek who has everything?”. This particular question can be answered with the “Beer Caramelizer” by 1571F. Although this item clearly falls into the gimmicky territory of strange stocking stuffers and gag gifts, it does offer something unique. It can actually change the taste of your brew without a condensed liquid or flavor packet. 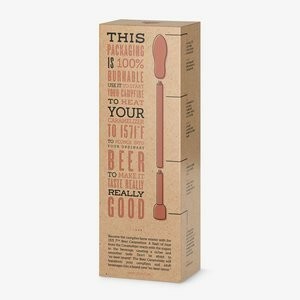 The beer caramelizer itself is a sturdy two piece steel rod set that screws into a highly polished wooden handle. The heavy weight behind it is rather nice and you feel like you are holding something of a decent quality. Now the premise behind this fancy metal stick is you place it in a fireplace, campfire, or the like and heat the rod. With this now red-hot poker you can dip it into a beer of any style for a few seconds, and the intense heat will instantly caramelize the sugars leaving you with a unique tasting beer. We here at GSN tried this with three different beers. A lager, a stout, and an ipa. For the most part the same thing can be said of all three. Each beer became smoother, and definitely had a slight sweetness added to it. However, the beers grew warm and somewhat flat after the procedure. This worked alright with the stout, but for a lager or an ipa, it didn’t seem to improve an already fine beer. It’s definitely interesting to try this new flavor and mouthfeel, but in general terms, it doesn’t do any favors to the brew. Lastly, while this is indeed a unique product, there are a few things that should be made clearer on the packaging. Obviously, the nature of mixing red-hot steel bars, campfires, and alcohol is perhaps not the safest activity. This coupled with using the heated steel in a beer glass could potentially cause breakage. Cold glass and hot metal do not mix well. Here at GSN we used a ceramic beer stein to test this, and didn’t feel like risking any other glassware. This is clearly a gimmick, and while it’s fun to try once, it seems a little odd, dangerous, and best left for the beer geek, who has everything else.